Plus, it's really close to Cambodia and Thailand. If you've ever envisioned a Southeast Asian tour, Vietnam would be right smack in the middle of it all. It's an easy bus ride from Cambodia or Thailand, both of which border Vietnam on opposite sides. 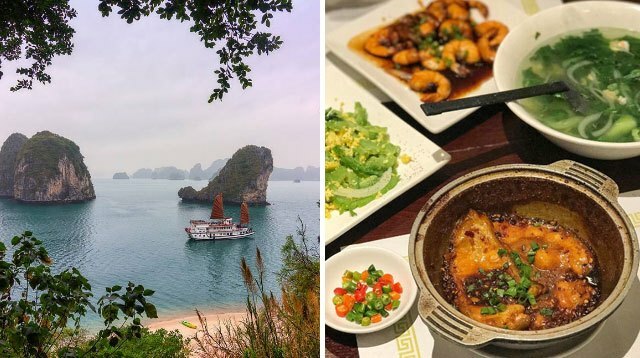 Accessibility aside, Vietnam is home to so many different landscapes and flavorful food—what are you waiting for? See the floating markets and travel to the river's side canals on your own little boat. The experience becomes even more authentic once you put on your non la (a conical bamboo hat which is laid ready on the boat). Get a guide to help you paddle, and you'll be on your way. The Mekong River flows from China all the way to Vietnam and legend has it that a huge water serpent lies beneath its belly. Imagine tall rock formations amid a beautiful turquoise seascape. Ha Long Bay is the place to be for picturesque island views and relaxation. Personally, it's so beautiful, it reminds me of El Nido, Palawan (except with cone-roofed boats and floating houses populating the water). View the limestone cliffs and pay a visit to their hollow cave insides—Hang Dau Go is worth a look-see as it is the largest cave in the area. If you're looking to experience local traditions, go up North to Sa Pa. It's a bustling market town with locals going about their harvest routines. It's laden with rice terraces and mountains all around. Mount Fan Si Pan, which boasts the country's highest peak, looms in the distance. For the full introduction to traditional countryside living, visit a minority village on a trek up the rice paddies. While Ho Chi Minh is the most popular city in Vietnam, it isn't the only option. If you want a balance of serenity and chaos, Da Nang could be the place for you. Once a shy provincial town, Da Nang is seeing exponential development in the form of modernist hotels, chic apartments, and the famous Dragon Bridge, which projects neon lights across the Han River on the weekends—think the Brooklyn Bridge illuminated with the lights of the Eiffel Tower at night. What's more, Da Nang achieves both city and countryside aesthetics with tourists heading for street food crawls during the day and residing in beach-side resorts in the evening. Crackling fried rice crepe, anyone? Banh Xeo is known as a sizzling cake filled with bean sprouts, mung beans, shrimp, and other add-ons. Hot rice batter poured onto a hot skillet makes a crackling sound and forms the cake. If you like traditional homemade pancakes, you will love this savory rendition made of rice flour and turmeric powder. Ba Duong in Da Nang city is one of the best places to experience this amazing dish. Vietnamese locals know this as their go-to comfort food. Ca Kho To is caramelized slow-braised catfish, and yes, it is as delicious as it sounds. This sweet and salty delicacy is traditionally made and served in clay pots. It uses the middle part of the fish while the head and tail are reserved for later use in other dishes. You can find this dish in traditional Vietnamese restaurants as well as in some elusive street food stalls. Even with the plethora of interesting food to try in Vietnam, there is always room for dessert! Banh Kep La Dua is a coconut pandan waffle with a seriously aromatic feature to it. It's delightfully green with hints of brown in color, and packs a lot of flavor even without the syrup. The marriage of the pandan and the coconut makes a perfect pair.